Jaguar has launched the long-awaited Jaguar F-Type, an all-aluminium sports car, and spiritual successor to the iconic E-Type. Available in three different engine configurations, (V6, V6S, V8), the cars feature a stunning range of new in-car tech to drool over, as well as some exotic motoring tech in the form of deployable door handles, interior vents that rise out of the dash when required, and an automated spoiler. Add to that an active exhaust system that ensures you're always making the best and loudest use of your supercharged BHP, and one of the most neutral-handling chassis in the business, and you're talking a proper super car, more than capable of fronting up to Porsche's 911. We took ourselves off to a Spanish race-track for the launch event, as you'll see in the video above. Flipping through the 8-speed gearbox via the F1-style steering paddles is effortless - partly due to Jaguar's use of engine rev management to blip the throttle as you change down, stabilising the car – and provides explosive acceleration, especially with the S model's launch-control function. The F-Type and F-Type S are both powered by a new 3.0-litre supercharged V6 engine, producing 335bhp and 375bhp respectively. 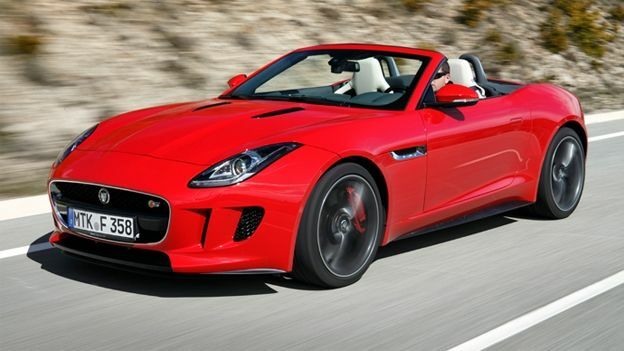 The range-topping F-Type V8 S crams a 488bhp 5.0-litre supercharged V8 under the bonnet. This translates to a storming 0-60 time of 4.2 seconds in the V8, 4.8 in the V6S, and 5.1 sec in the base model. In the cockpit-like interior, the central console contains a touch screen satnav, as well as the audio controls for the Meridian system. Available in three flavours, from 10 or 12 speaker setups that deliver a blasting 380W or 770W, and finally Meridian's Trifield System at the top. Overall, it's a very premium sport scar, the very-adjustable leather seats wrap around you to provide a sit-in feel, and the engines are immensely pleasurable yet tractable, both in power delivery, and also in sound. The downside? The boot on all models is tiny (200 litres apparently), and fuel economy isn't worth discussing (in spite of de-rigueur stop-start). But in return you get a slice of motoring pleasure that's guaranteed to put a smile on your face – priceless. The F-Type will be shipping to lucky buyers from April 20. Jaguar F-Type UK prices start at £58,500 for the basic model, F-TYPE S for £67,500 and the F-TYPE V8 S for £79,950.